Introducing.. 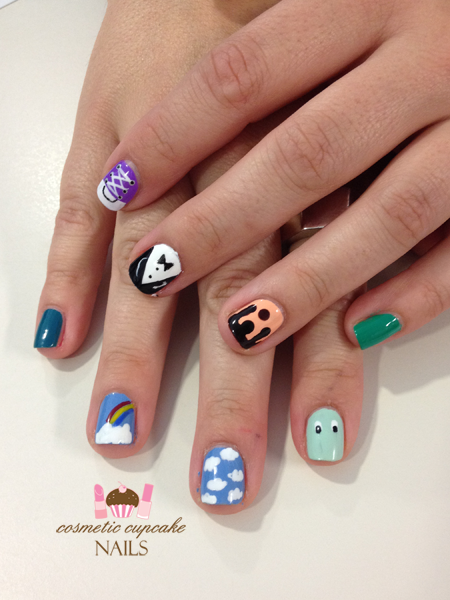 Cosmetic Cupcake Nails - Sydney nail art! Hello ladies! I've been away from the blog for a while oops but I have a pretty good excuse ;) I've taken the plunge and I am launching my own little Sydney nail art business - Cosmetic Cupcake Nails! I'm absolutely crapping myself but here goes nothing! I was approached by the team at The Finders Keepers Markets a while ago to get involved in the markets that they're curating for the upcoming St Jerome's Laneway Festival in Sydney and Melbourne this February. Ever since teaching my first nail art class with Work-Shop last year, it's cemented my love for nail art and wanting to share it with everyone! I've long admired the work of amazing nail artists like The Illustrated Nail, WAH nails, Sophy Robson, Trophy Wife Nail Art and I Scream Nails (just to name a few!) and of course dreamt of doing nails for a living just like them. The offer from The Finders Keepers team gave me the kick to finally take the leap this year and take baby steps towards making my dream a reality. 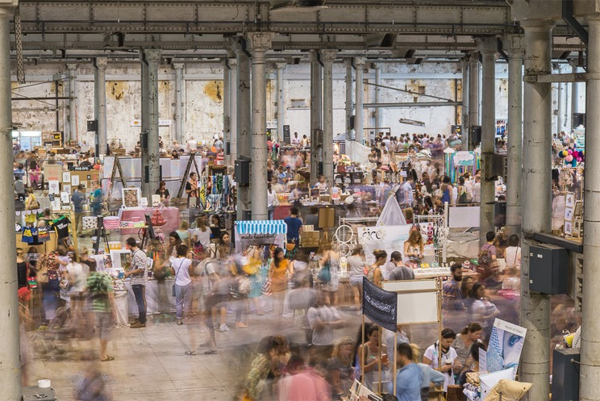 If you haven't heard of The Finders Keeper markets before, they're twice yearly markets held around Australia that showcase the work of up and coming designers and artists. I'm so excited to announce that I'll be alongside some amazing Sydney designers at Laneway Festival Sydney on Sunday 2nd February 2014. I'll be offering express nail art manis - so plain polish and 2 accent nails - with a selection of about 10 designs (I'm still a bit undecided what I'll do oops!). I'll also be selling some hand painted false nail sets too! Make sure to check out all the details on The Finders Keepers blog for the full lineup of designers who'll be there. If you're going to the festival I hope you'll stop by my stall to get your nails done!! Thanks to my friend Bek for being my guinea pig and hand model! I won't be working from a permanent space yet so I'll be freelancing and be available on a "pop up" sort of basis for parties, hens, events, nail art workshops or even if you have a few friends that want manis done something can always be organised ;) It's all still extremely new and daunting and I'm fitting it around work but we all have to start somewhere right?! I don't have much yet but please do show me some love and follow me on Instagram, Facebook and also check out my site! Hello ladies! It is absolutely STINKING hot in Sydney at the moment - up to 38° in some parts of Sydney! 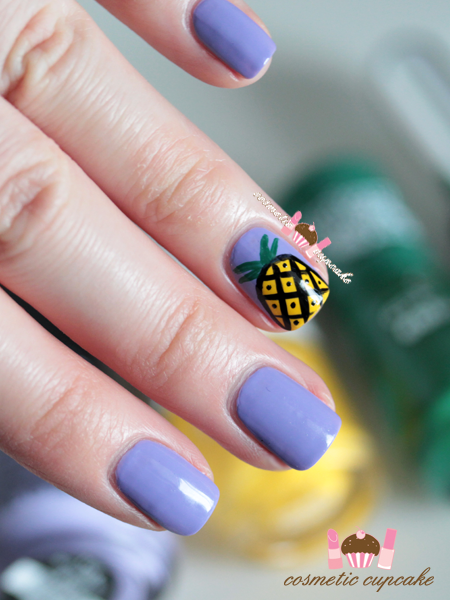 So what better time to do some tropical fruit nail art! You know how much I love my fruit manicures ;) I decided on pineapples because this is the perfect weather for it and because I wanted to try out the cute design from Trophy Wife Nail Art. I seriously love Chelsea Bagan's work! 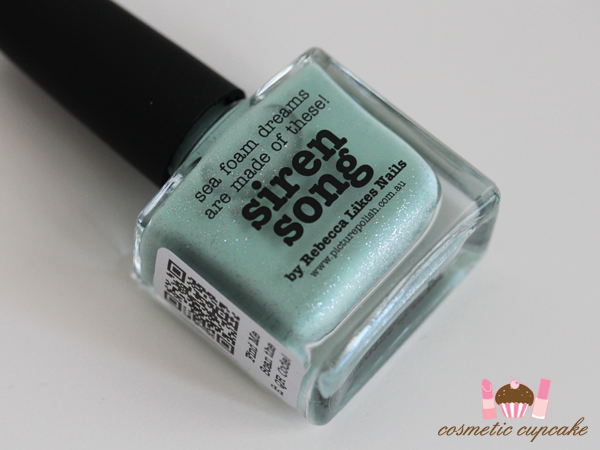 I used 2 coats of China Glaze Tart-y for the Party from the Avant Garden collection as a base for all nails. I then used Colour Theory Pineapple Express to freehand the body of the pineapple - the shade is SO well named I think! I used Kiss nail art striper in black to outline the pineapple and add the helixes and finished it off by using essence colour & go in the green & the grunge for the crown. I haven't been able to polish my nails lately because my eczema has flared up really badly making removing polish a nightmare. You can see in the above pic I have a bad patch on my ring finger and my skin is just so dry and yuck X( It's just taking forever to clear up even though I've been hitting it with everything!! Doh! I hope you guys are all doing well! What do you think of this fruity mani? Thanks for looking as always! I'm a bit of a cuticle product fanatic so I'm always on the lookout for new products to try. I love trying balms, oils, butters.. you name it. So how could I resist when I discovered this ABSO-FREAKING-LUTELY BEAUTIFUL limited edition Anna Sui nail care oil when I was in Hong Kong last year?! Ok ok I admit I'm biased though because I adore anything and everything Anna Sui especially when it comes to her nail products. The oil is housed in the beautiful signature Anna Sui dress shaped bottle which is very easy to hold and use considering the shape. 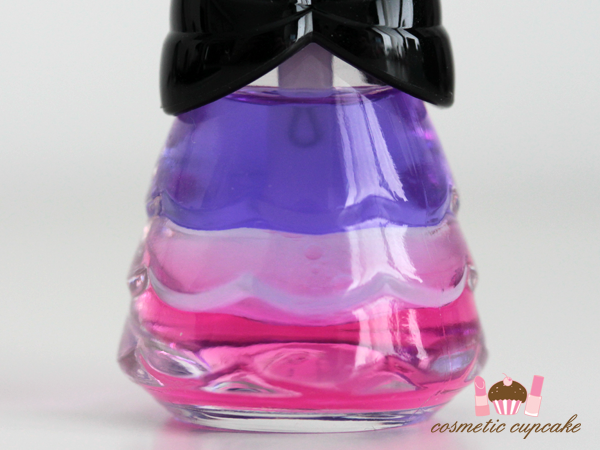 The oil contains three tiers in purple, light pink and a bright pink - my favourite colours and just so girlie! It smells like roses as her other products do but I found it quite subtle compared to the other liquid based products I've tried from her makeup range. The brush is flat and square - which for a polish I would most likely find a bit difficult to use and to get a clean finish but for a cuticle oil it's not a problem. To use it, you need to give it a gentle shake to mix the 3 layers which forms a milky lavender shade. The formula is absolutely fantastic - it's wonderfully moisturising, non-sticky and most importantly very fast absorbing. When the sales assistant tried it out on me I was so surprised at how smooth the oil felt and how quickly it absorbed leaving my fingers feeling and smelling lovely and rose-y. A little goes a very long way and you only need a small swipe to hydrate your entire cuticle. The formula is silicone based and contains plant-derived squalene and smooth oil to lock in moisture and hydrate. 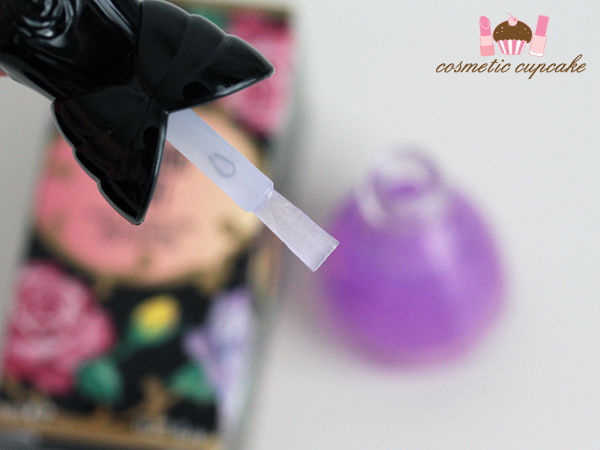 Overall: I am absolutely head over heels in love with the Anna Sui nail care oil. It smells amazing, absorbs quickly and is just so so beautiful! I can't recommend it enough and it's a must buy if you come across it. It's a bit on the pricier side at about $18Aus but a little goes a long way and it's Anna Sui. Enough said! Details: I purchased my bottle from the Anna Sui stand at LCX in Harbour City in Tsim Sha Tsui, Hong Kong for $130HK (so about $18Aus). I found it available online from Urban Outfitters and beauty.com for $16US and YesStyle.com for $22US. What are your favourite nail treatment products? Any recommendations?